Each year during the Christmas holidays, my mother used to write out (by hand and with carbon paper - bet most of you don't remember carbon paper) a long Christmas letter to family and friends, with updates on our nuclear family's activities and accomplishments which had taken place during the previous year. It's a tradition which has been lost over time with the exception of one cousin who has lived in Australia for 45 years now. Even he now sends out his Christmas letter via email. But this year, I'm going to revive the tradition and send real, live, postage-paid, letters to many friends and distant family members. I decided since card making has become one of my favorite activities, and since many of the family members expect to get a card from me, I'd combine the two and send out letters inside a tri-fold, CS cover which will also serve as the envelope. I've made a dozen of these and have another half dozen to finish. I've actually made two versions of this and this one uses the 'negative' die cut. The dies are Memory Box. On the other style, I used the positive, that is, the actual die cut words. I haven't photographed one of that style yet but the words are mounted onto a long rectangle of light red CS for a red and green combo. I used tiny, metal brads in the center and dimensional holly and berries. The letter will be on regular 8.5" X 11" paper and it will tri-fold inside the cover, being stapled to it at the top. I'll use a small Christmas sticker to hold the flap closed for mailing. Great idea Connie and a cute way of doing the letters too. I like the idea of using both the positive and negative of that die cut too. We have one family member that still does the Christmas letters and it's always so nice to get it and see what's been going on in their life for the last year. 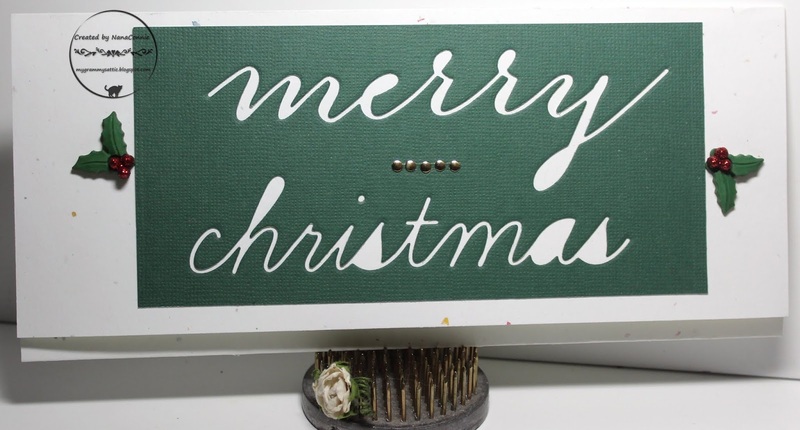 Love that there is no waste with your Merry Christmas die cuts! I remember those letters, but we never got that many any more, not even that many Christmas cards! Letter writing and sending cards seems to be a lost art these days, such a shame, I love saving cards that are sent to me, there is nothing like going back to re-read a card! Fabulous idea Connie, I am sure your family and friends will love the letters too. I do love this card today. Such a lovely idea, I get a couple each year from "old" friends that we have no contact with other than these letters, it's good to catch up. LOVE the card you have done to send them. What a wonderful idea! I love the design. Thank you for sharing with us at Creative Inspirations, good luck and I hope you will join us again! Beautiful creation Nana Connie, fabulous idea! Thank you for sharing with us over at Let's Craft and Create. We hope to see you again. Beautiful creation Nana Connie! Thank you for sharing with us over at Scrapy Land. Hope to see you again. Brilliant! Thank you so much for sharing this with us at Creative Inspirations. Good luck! I love traditional and this is perfect! Thanks for joining us at PIP Challenges!